This fun and easy book and CD takes you from the very beginning. Learning right and left-hand techniques, learning your first chords, 18 great songs AND you painlessly learn them by reading notes. Anyone can do it. Steve's method and approach to learning to read notes is so simple that 4 year olds have done it. You will start with 4 simple notes. Steve then teaches songs using just those four notes. 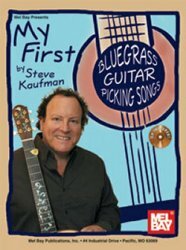 He systematically adds a few more notes at a time bundled with easy to understand instructions and songs so that in a short time you will know all the notes, chords, strumming patterns to play hundreds of songs. This is a perfect primer for many of Steve's best sellers and other author’s books. Audio CD included.